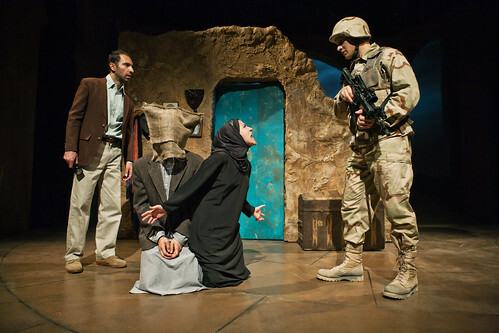 Marines (Craig Marker, left, and Gabriel Marin, right) guard a hungry tiger (Will Marchetti) in the bombed-out Baghdad Zoo in the San Francisco Playhouse production of Bengal Tiger in the Baghdad Zoo by Rajiv Joseph. Below: A night raid goes very badly for translator Musa (Kuros Charney, left) an Iraqi couple (Pomme Koch and Sarita Ocon) and for Kev, a volatile American solder (Marker). Photos by Jessica Palopoli. The last time San Francisco Playhouse produced a play by Rajiv Joseph — Animals Out of Paper in 2009 — the young playwright was becoming one of the hottest writers in the country. TheatreWorks produced his The North Pool in 2011, just as his Bengal Tiger at the Baghdad Zoo was preparing to bow on Broadway in a starry production that featured Robin Williams as the titular caged beast. Joseph, with his Tony Award and Pulitzer nominations, has fully emerged as an American playwright of note and his work is back at San Francisco Playhouse to launch a new season, the second in the stellar theater on Post Street. In Bengal Tiger at the Baghdad Zoo, Joseph has crafted a challenging war/ghost story that wrestles with the very notion of god (or, if you prefer, God). This world and the next intermingle in the rubble of our desert war as Joseph examines the costs — physical and spiritual — of brutality. Through performances and design, director Bill English creates a provocative world that allows the poetry of the dead and the garish reality of the living to blend in surprising, moving and perplexing ways. It helps that English is also a masterful set designer who places the action in the remains of a palace that, with the assistance of a few moving set pieces, becomes a topiary garden in a Hussein family manse, a military translator’s office, a hospital room, a bombed-out leper colony and the remnants of the Baghdad Zoo. Dan Reed’s lights and Steven Klems’ sound design add texture and mood to the setting, which is somewhere between dream and waking. 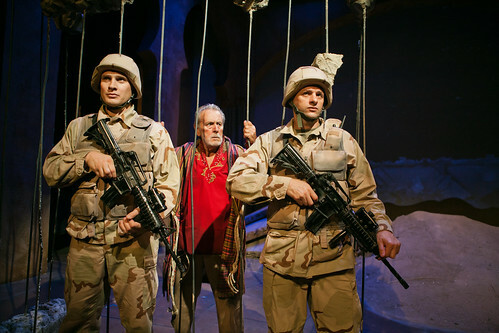 Without a clear protagonist, Joseph’s play is collage of Iraq experiences ranging from the American military (Craig Marker and Gabriel Marin as Marines) to the Iraqi civilian (Kuros Charney as Musa, a former gardener now working as a translator for the Americans). And in between, there are beings from another realm — a recently deceased Bengal tiger from the Baghdad Zoo (a deadpan Will Marchetti), Uday Hussein (Pomme Koch) carrying the severed head of his brother, Qusay, and a young Iraqi woman (Livia Demarchi) tortured and killed by the Hussein brothers. Joseph doesn’t go down conventional roads with this story in any way and dispatches sympathy and empathy from the start. No one here is terribly likable, but then again, this is death and war. The Americans are ignorant, money-grubbing animals, while the tiger is an admitted atheist deep in thought about his place in the universe. Death brings vast intelligence to the ghosts who, for whatever reason, are still stuck roaming the human realm, and the living just seem to grow less intelligent. English’s cast brings ferocious authenticity to Joseph’s tricky playing field, and while it’s hard to remain fully emotionally involved in this two-hour play, its provocative power is undeniable. The presence of Uday Hussein is especially troubling — the thought of that kind of evil never quite leaving and continuing to inspire more evil fogs the play with the mist of hopelessness. The only real kindness in the play is shown by a leper (Sarita Ocon) who comforts a man whose damage, greed and selfishness have brought him to his inevitable end. Bengal Tiger at the Baghdad Zoo is a strange, prickly play — not a crowd pleaser so much as an act of thoughtful provocation filled with vivid portraits of ghosts and humans wandering a wasteland of their own creation. Rajiv Joseph’s Bengal Tiger at the Baghdad Zoo continues through Nov. 16 at the San Francisco Playhouse, 450 Post St., San Francisco. Tickets are $30-$100. Call 415-677-9596 or visit www.sfplayhouse.org.